He was born in 1800 in Italy. His family dated back 500 years and was quite wealthy. His father did not manage the family finances very well and the family had to move from their ancestral home in the country to take up residence in Naples, dropping to a lower standard of living. 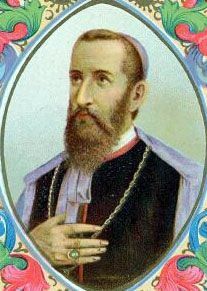 He entered the Congregation of the Missions (Vincentians) on October 17, 1818, took vows on October 18, 1820 and was ordained on June 12, 1824. Following his ordination he traveled in Italy giving missions and retreats. He became well known as a preacher and confessor. He became director of seminarians in 1836 where he was remembered for emphasizing personal prayer. He was among the priests who ministered during the cholera epidemic in Naples in 1836-1837. In 1838 Justin heard that there was to be an attempt to launch a Catholic mission in Ethiopia. At the time of Justin’s arrival in Ethiopia in 1839, there was not even one Ethiopian Catholic in the country. Catholic priests were liable to immediate execution if discovered so for Justin and two other Vincentian priests, they decided not to let themselves be seen celebrating Mass. Justin was ordained a bishop in secret in 1949. For the remaining 11 years until his death in 1860, Justin’s life was a series of problems, harassment, persecution, and even a spell of imprisonment, all originating in the opposition of his missionary methods. He had consecrated 20 priests and made 5,000 converts. One of his converts is Blessed Ghebre Michael. In 1860 the new king of Ethiopia prohibited Catholicism and Justin was imprisoned for several months. He spent the remaining months of his life in missionary work along the Red Sea. He died on July 31, 1860 of a tropical fever while on a missionary trip. Justin is considered an apostle to Africa and the founder of the Abyssinian mission.